Influx of Insanity were crowned winners of BurySOUND 2018 last night (9th March) at The Apex, Bury St Edmunds. Kelodown kicked off what promised to be an insane night with their brand of hard rock which sounded so much better on a bigger stage. They opened with Occupational Hazard, a great up-tempo track that really got the crowd moving. The vast amount of energy on stage as a joy to see, the perfect way to open the night. The psychedelic sounds of KYANOS came next, a world away from the hard rock before. Their setlist featured some ‘old’ favourites like the stunning Thunder In Japan but also featured various new tracks from their upcoming record Lost In Blue. A band to keep an eye out for because if the rest of their record is as good as So High then they’re on to a winner. Math-rock foursome Indecision were something of an unknown entity going into this year’s competition and having not seen Heat 4 I was intrigued about the band. They have a great selection of tracks like 60s, and their frontman is something else too. A great tone to his voice and not to forget his hilariously great dancing meant this was a memorable performance indeed. Grunge-blues trio Organ of Corti closed the night with their extensive sounds. Their performance in the first heat was hard to beat, but they were a thousand times better on The Apex stage. A real surprise to the competition, give them time to develop and hone their sound even more and they could be a really really special band. Whilst judging the competition, the crowd were treated to a headline set from 2017 winners and all-around legends TUNDRA. Their setlist consisted of new tracks from their upcoming EP (27th April can’t come soon enough) and favourites like Loser and Vacation (Cheer Up Chuck) which resulted in a stage invasion. It’s been a great start to the year for Elliot, Caitlin and Elliott having supported Marmozets at Cambridge Junction, and with the EP out soon, 2018 could be a huge year for them! 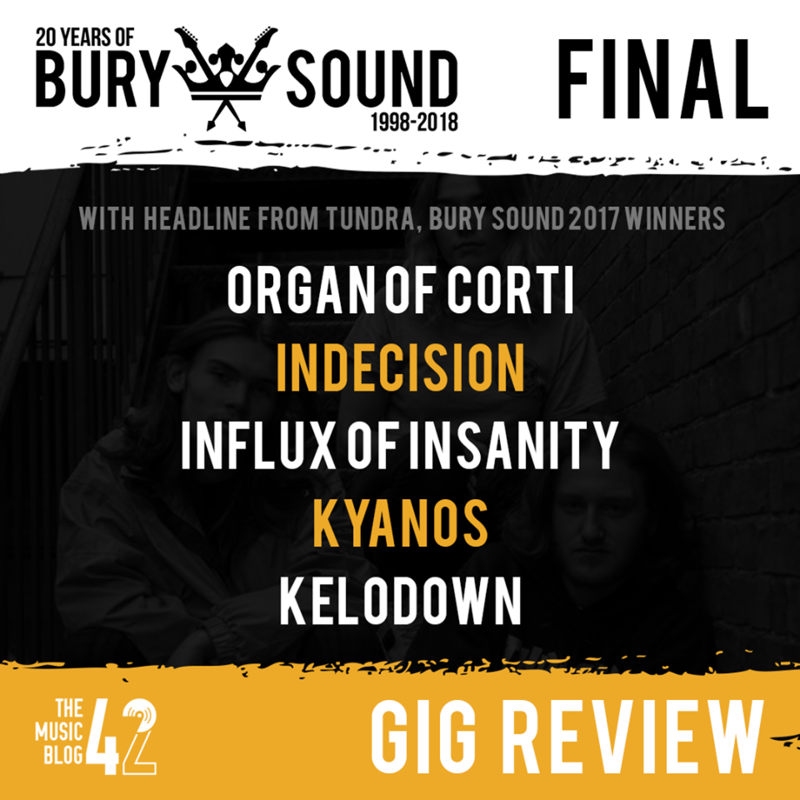 Congratulations to Influx of Insanity on winning BurySOUND 2018. Also congratulations to KYANOS for winning the Rising Star award! Me and Guy would like to thank Seymour Quigley and Tim Willett for choosing us to judge this year’s competition. We’d also like to thank Joe, Jay, Linzi, White, Catherine, Neil, Claire, Sara, Davey and the other judges for making us feel so welcome on the panel. We can’t wait for next year already!